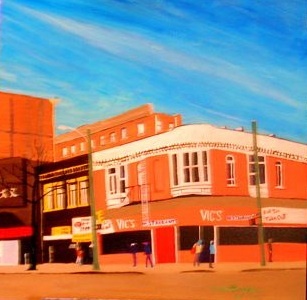 The old Vic’s restaurant, replaced by the trendy new Waves Coffee house, (Main and Cordova). For me, Vic’s was the perfect subject to place in this installation. Vancouver, on the cusp of its 125 birthday, started in this community. Today our community is battling gentrification and trying to stay alive. One can look at this painting; reflecting, honoring and celebrating what we are still struggling to maintain. Meanwhile, elements giving character to our neighbourhood, making it special in the cities history, are quietly slipping away. With them go as well the people making up this special, close-knit community. 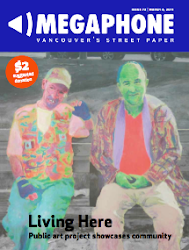 Many are artists, only surviving in Vancouver because the DTES (down town east side), allotted them an affordable place to work, live and thrive within the heart of the city.